The Capitol in Horsham has made its final casting announcement for this year’s magical family pantomime Sleeping Beauty. Completing the line-up for the winter extravaganza are West End star James Dinsmore and singing sensation Natasha Hoeberigs. Born and educated in Glasgow, James Dinsmore has toured extensively across the UK as well as the Middle East, Australia and New Zealand. He is no stranger to Horsham’s Capitol as he played the evil Abanazar in Aladdin in 2016 and Captain Hook in Peter Pan back in 2013. This year James will be back to play King Joe in Sleeping Beauty. New Zealand-born Natasha graduated from Mountview Academy of Theatre Arts, London, in 2017 and went on to star as Snow White for QDos Pantomimes in Darlington last Christmas. Before her London studies, Natasha worked in plenty of theatres internationally in productions including Wicked and Chicago. She has also featured on television as a solo artist on The Voice Australia and as a Semi-Finalist in Australia’s Got Talent. Natasha said she is thrilled to be portraying Princess Aurora (one of her favourite princesses) this holiday season. Tickets for Sleeping Beauty cost £22.50-£23.50. 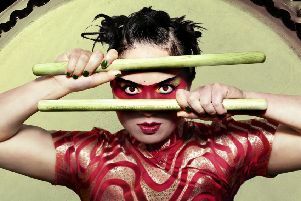 They are now on sale at www.thecapitolhorsham.com or via the box office on 01403 750220. Email contact@thecapitolhorsham.com to find out more.